Both long-distance runners and casual joggers can improve their performance by keeping their feet in top condition and taking steps to control foot problems common in runners. The human foot is a biological masterpiece that amazingly endures the stresses of daily activity. For runners, the feet are more vulnerable to injury than any other part of the body, and these athletes should be on the alert for signs of foot problems that can slow their stride down if not treated promptly. The most common complaint from runners is heel pain. This condition, also called plantar fasciitis, is frequently caused by inflammation of the ligament that holds up the arch. In athletes, heel pain can result from faulty mechanics and over pronation in which pressure is unequally applied to the inside of the foot. It also can be caused by wearing running shoes that are worn out or too soft. At the first sign of heel pain, the physicians at Alaska Foot & Ankle Specialists recommend runners do stretching exercises, wear sturdier shoes and use arch supports. In some cases, icing and anti-inflammatory drugs, such as ibuprofen, are helpful. Should heel pain continue, custom orthotics, injections and physical therapy may be required. Surgery normally isn’t considered unless heel pain persists for more than a year and conservative treatment has failed to bring relief. Neuromas and tendonitis are other common foot problems that affect runners stride. A neuroma is a pinched nerve between the toes that can cause pain, numbness and a burning sensation in the ball of the foot. Overly flexible shoes often are the cause and padding, orthotics or injections usually are effective. Sometimes surgery is the answer if pain between the toes continues for more than six months. There are several forms of tendonitis that affect the achilles and other areas, and all are treated with rest, icing, stretching and anti-inflammatory medications, and sometimes with orthotics and physical therapy. Over-zealous training usually causes tendonitis, especially among beginners who try to do too much too soon. 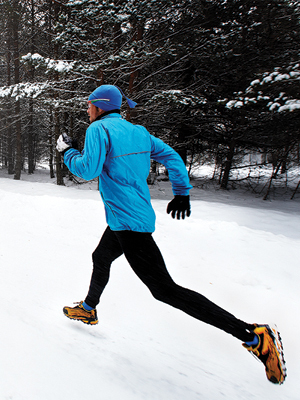 Don’t let pain affect your stride on the trails. Contact Alaska Foot & Ankle Specialists today and schedule a foot consultation.